Nebraska season opened Sept. 15 and I feel fortunate to have filled tag No. 1 with this deer I'd guess to be 4.5 years old. Took him just before quitting time while too many others were at home, bemoaning the 83-degree heat and the full moon. I used my 'Green Machine' Pronghorn take-down longbow and Wensel Woodsman heads. 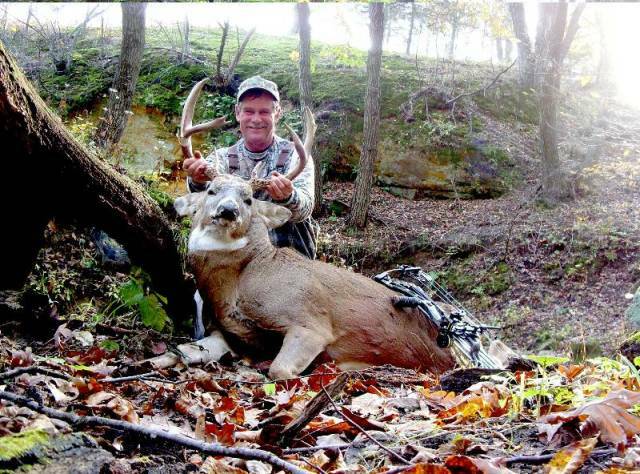 It was a 10-yard heart shot and 55-yard recovery; the buck had just passed through a marshy area enroute to a cornfield. 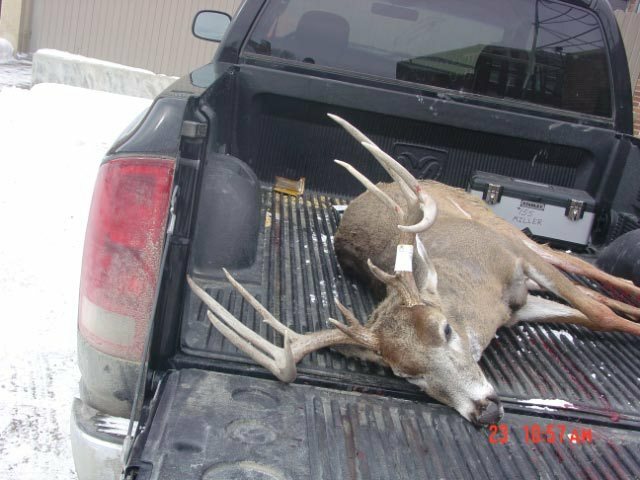 I passed this deer up on the last day of our NE season in '07 (Dec. 31) and I guess this is the result. I have his right side sheds from the two previous years and unless I'm wrong about his initial age, by my estimation he went from about a 96" buck as a 2.5-year old, to 113" as a 3.5-year old, to grossing about 139" as a 4.5 year old. The tiny G4 on the right side was exactly the same as last year, but the rest of his rack improved dramatically. Morgan harvested her first deer on her third official hunting day. The doe passed by her ground stand position at 15 yards. 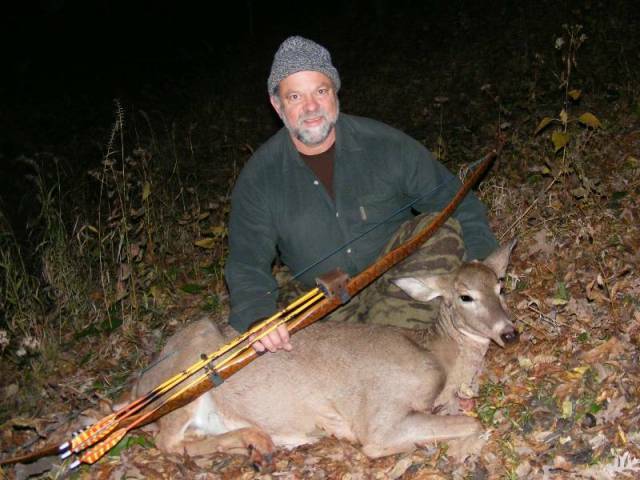 She placed a perfect Beman arrow tipped with a Muzzy 90 grain broadhead right through both lungs. Dad got it all on video. Mom was present as well and the parents witnessed the entire event. What a hunt of a lifetime! Her youth tag is filled. She executed absolutely perfectly. Equipment: Hoyt Trykon Jr., Beman ICS Junior arrows, Muzzy fixed blade broadheads, Tru-fire release, Lumenok, Fuse quiver, whisker bisket, Tru-glo sight. 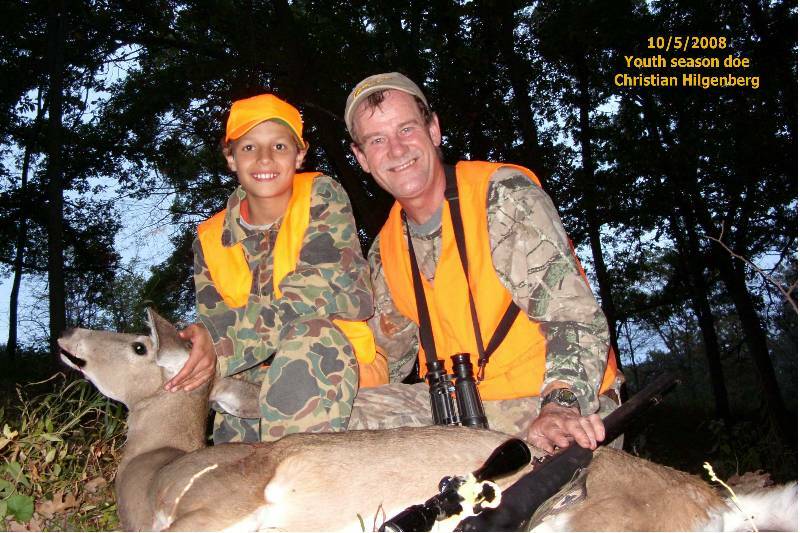 Christian Hilgenberg took this large old doe at 6:30 on the last evening of Youth season, October 5th 2008. Scouting, legwork and finally, patience and waiting for the perfect 45 yard shot, resulted in a quick clean kill. Grandpa Dean was every bit as proud as Christian for taking the old doe with a Knight muzzle-loader using 70 grains of Pyrodex and a Knighrt sabot holding a solid copper Barnes bullet. I punched my second NE buck tag with this dandy 4x4 (actually two additional 1" stickers that are hard to see) on Oct. 4. Brand new property in Butler Co., NE about 640 acres but about 550 acres are crops and the rest CRP and a duck pond. Biggest trees on the whole place are thigh-sized (at the base) cottonwoods and only a handful of them will support only certain tree stands. It's totally different than anything I've hunted before, but I spent a couple afternoons scouting it in late Aug/early Sept, and then slipped in on a super windy Oct. 4 with a stand on my back headed for a tree I'd picked out a month earlier. Long story short, I got the stand put up (but only 8' high...impossible to go higher) and then just after sunset a good-looking 115" 4x4 and this 140"er step out of a little sandy/scrubby/weedy bedding area just to my south. The wind's blowing 25-35 mph and I'm swaying up in this sapling and videotaping both bucks, trying to decide whether to take the larger of the two. They eventually end up directly under me at 4 yards, which is dang close when you are 8' up. I'm changing my mind...so with the winds covering me, I switch weapons and drill the big one with my Pronghorn longbow. The Woodsman hits where I'm aiming, and next thing you know I'm out of NE buck tags and we haven't even gotten to the best part of the season yet. This is the first season I've NOT drawn IA in a western zone during even-numbered years, and it would've been the perfect year now to really devote some quality time to my spot in western IA. Bummed about that, but I've still got basically unlimited doe tags in NE, and I'm exploring a couple NR options while still on cloud nine with these two bucks. 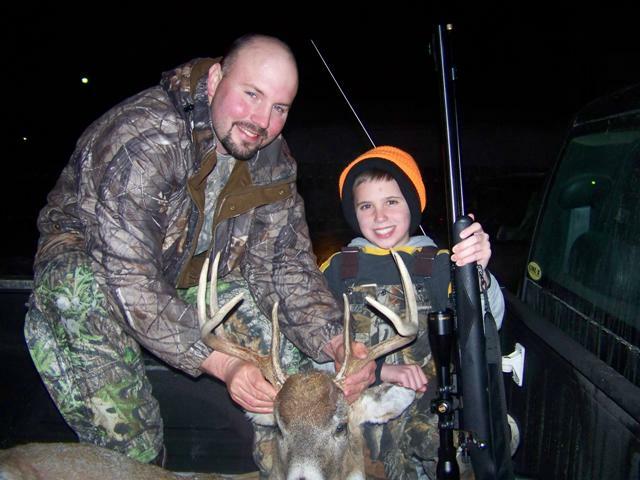 I'm sending a couple pictures of my grandson Keenan's doe shot last Wednesday with Knight Wolverine smoke-pole. He shot it at 65 yards, 5 minutes into our hunt. Perfect shot placement and a short recovery left us with enough time to enjoy the rest of the evening in the stand watching 5 bucks and a dozen does. Here are a couple pictures of the ten pointer I harvested on Sunday morning in the wind. The buck was obviously in rut and following a doe. Both spooked when the doe cut my scent trail under my tree, but I was able to hit the buck at about 20 yards with a hurried shot. At first I thought I had a bad case of ground shrinkage as I approached the deer, but the size of the deer somewhat dwarfed the rack. He will gross about 150. 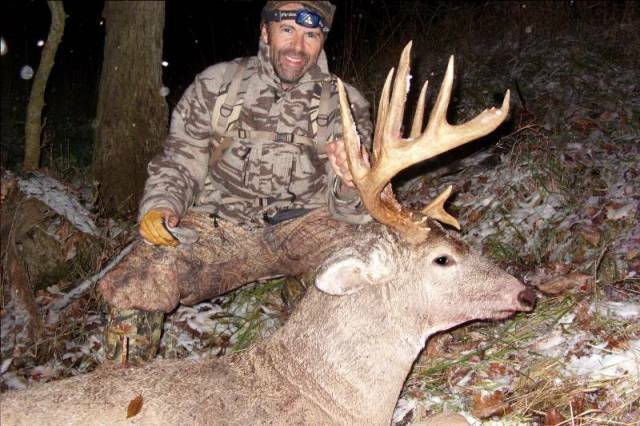 He was one of the largest bucks, in body, that I've ever taken. 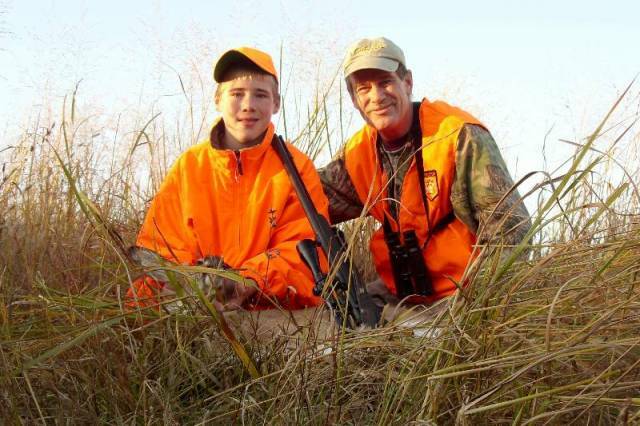 My hunting friends, Mike Stout and Ed Golay and five grand children helped drag the buck out of the timber. I switched to a new Bowtech Black Ice bow and a Scott release this year. For the first time I'm not shooting fingers and I am impressed with the ease and accuracy the combo provides. My Cabelas carbon arrows are tipped with 100 grain Scorpion mechanical broad-heads from NAP. PS. His mass will be about 17" per side as you suspected. Mr. Parris, Just wondering If I could get these pictures on your website. I have friends that have sent you pictures in the past and I frequent your site often. Below are the pictures and brief narrative of the hunt. Thanks. 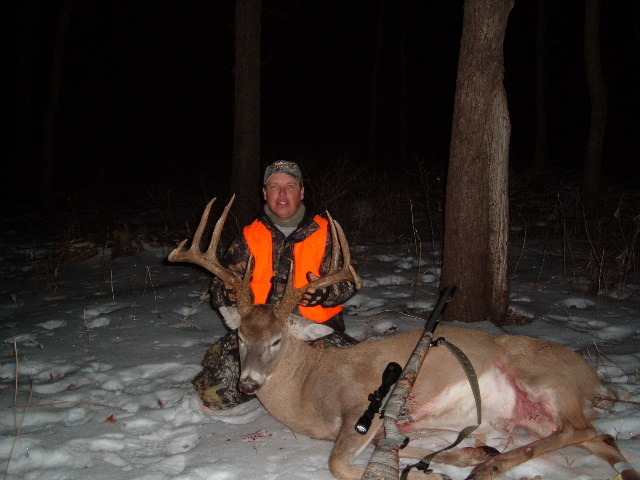 "I got set up in my stand at around 6:15 am on October 21, 2008. I have seen many bucks and does on this property early on. I saw this particular buck back in August while I was scouting. He was still in velvet and looked very nice from the binos. The morning was cold and a storm front was supposed to move in sometime that day. I watched a doe off in the distance in the bean field and at around 8:00 am the doe walked off into the timber. Shortly after, I saw this buck come out of the timber and start to work a scrape and licking branch. I grunted twice at this buck which was unsuccessful. The buck continued to work the scrape. I grabbed my antlers and started to rattle. The buck started to walk towards me across the bean field. The buck stopped and I rattled again. At that time he tucked his ears back, head down, and started to run right towards me. He came in to 33 yards but did not give me a shot. The buck turned and walked broadside less than 20 yards in front of my stand. I stopped the buck and let an arrow fly. 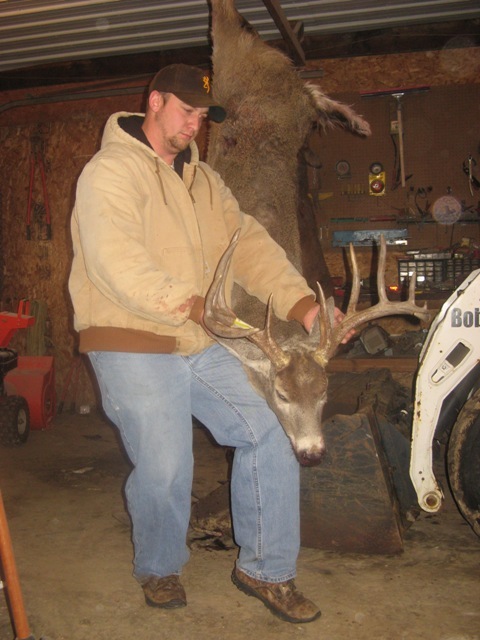 The Rage broad head went right through this deer. 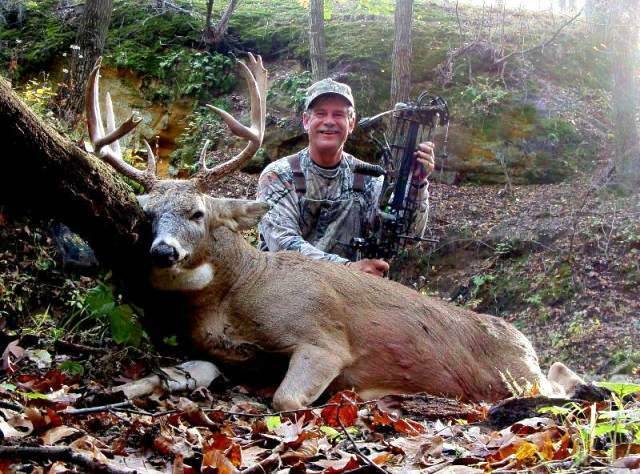 The buck ran approximately 80 yards and landed just inside the timber. 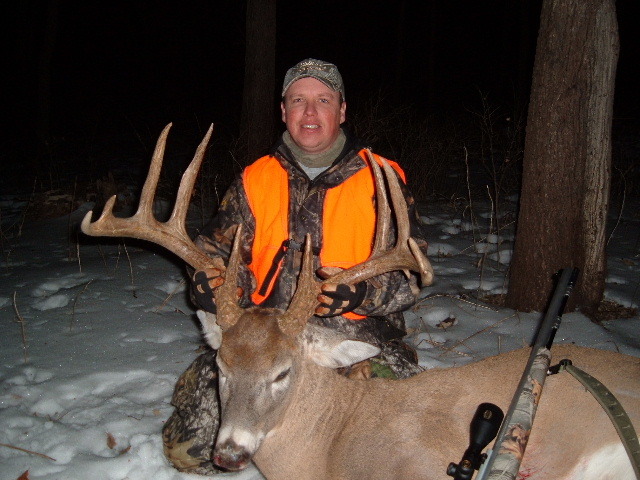 Not the biggest buck, but was a very fun and memorable hunt." 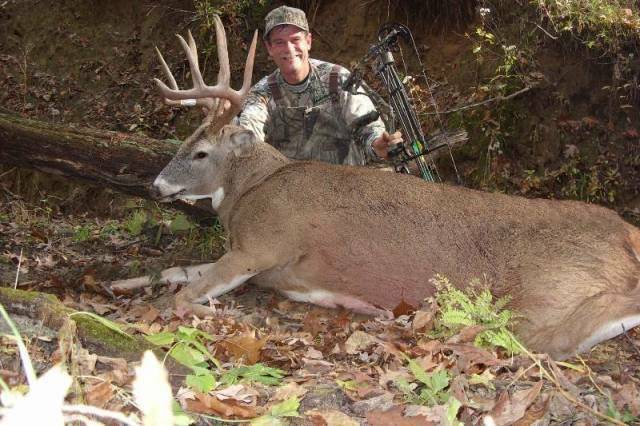 Shawn Web harvested three deer in four days with his "self made" bow. 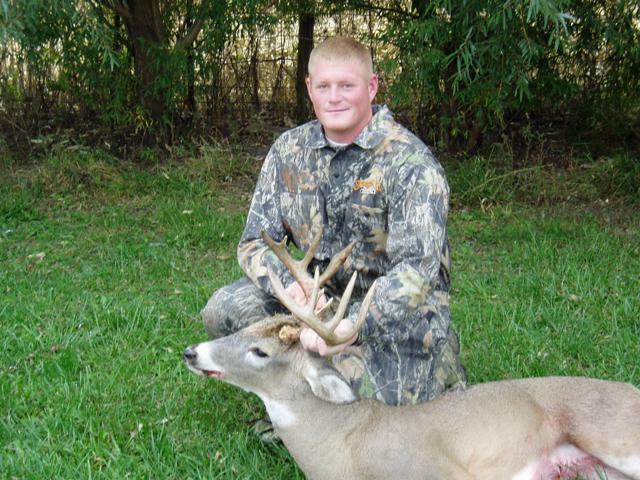 First he took two nice does and then a huge bodied nine pointer on Halloween Day. 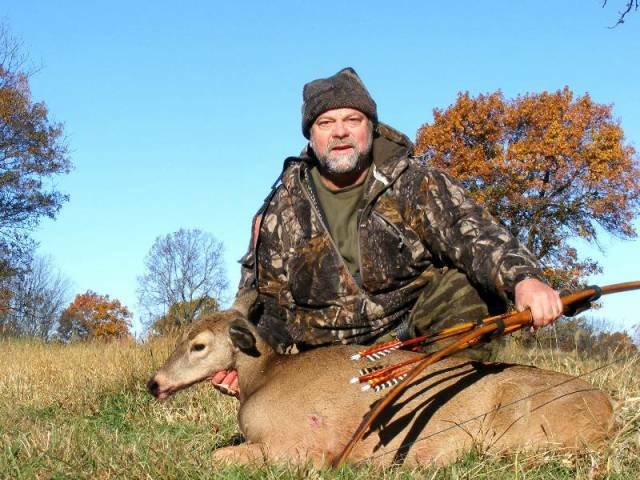 "It's as much fun as I've had in the tree-stand and very satisfying to shoot my best deer with a bow I built myself." The bow is made of Osage and beautifully crafted. I had a week off of school to come back home to hunt this fall. I was targeting a buck that possibly could have been the same buck that I missed last year, which was about 140" at the time. I spotted him early this summer before I had to go off to school, and he looked like he would be a good one. When I came home the majority of the corn was still standing, so I hardly saw any deer the first few days. I figured that I probably wouldn't see that buck in that area with the corn in and the temperature supposed to be rising at the end of the week, so I decided to go down to a different public area that I haven't scouted this year but always has good bucks in it. I set a buck decoy in a cut bean field about 30 yards from the edge of the timber, about 75 yards downwind from a corner where I expected the deer to come out of. I found a tree to climb and hung in it with my Tree Saddle. About 45 minutes before dark a spike and nice 2.5 year old ten point came into the field and toward the decoy, circling and posturing to it. Soon after a doe and two fawns came into the field and fed near the other deer. I could hear some rustling coming from the woods near the corner of the field, and soon this bigger buck stepped out. Right away I could tell that it was more mature than the other 2.5 year old in the field, and it had at least ten points and decent mass, but not much tine length. He was more hesitant to come in to the decoy and hung back about 40 yards away behind some limbs for about 6-8 minutes. He finally started feeding toward me and I knew if he would keep on that path he would give me a shot. Suddenly another large doe and her fawns entered the field about 5 yards from my tree, and the buck decided to come over and check them out quickly. He passed broadside between me and the decoy about 20 yards out in my shooting lane, I did a mouth grunt to stop him, but he turned sharply away from me, took two steps and turned toward the decoy, and was now standing broadside toward the way he came from. I released and watched the arrow pass through him slightly high in the lung area. He ran toward the middle of the field about 30 yards, stopped, did the old rubber legs and fell over. He's a mainframe 10 point with a busted G3, split brow tine, and busted kicker. Rough scored about 124" gross, higher than I expected. I was hoping for something bigger but I am happy with him and was able to get him processed before going back to school. 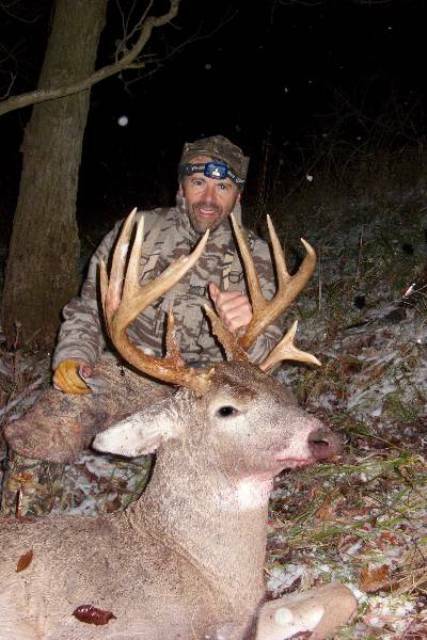 Last night Bob Ferri shot this bruiser during the last hour of his hunt. 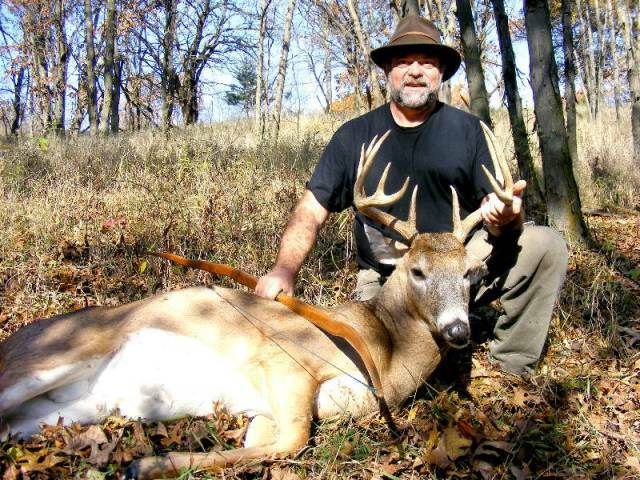 Mike Stout gave us a hand recovering the beautiful 10 pointer which was sporting a cool character building forked drop tine. The perfect shot from 12 yards with traditional equipment left us little to track, it fell within 80 yards. Congratulations to Bob for perseverance, crafty hunting skills and superb shot placement. It was a thrill to be a small part of the hunt. 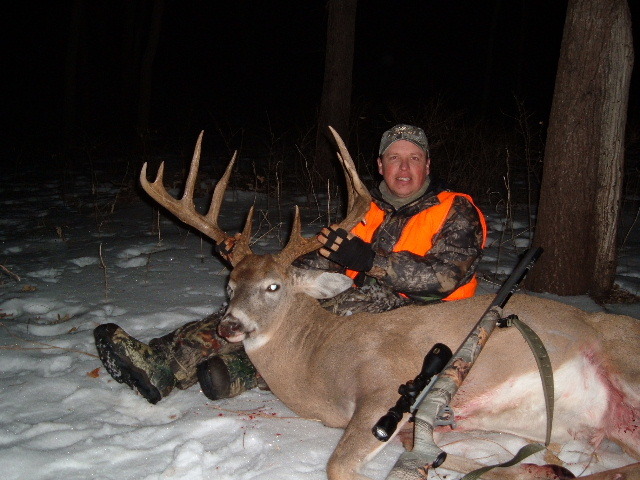 I'm also attaching a picture of the fine buck taken a week earlier by Shawn Web. 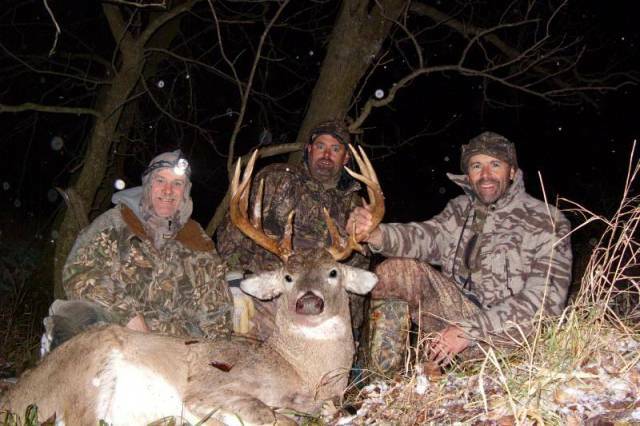 Jim Gilmer and Bob shared the hunting camp with Shawn. Three does were taken to help with herd management. Well done, gentlemen. Sunday was definitely a 'Blue Bird' day. I harvested a nice character buck. I honest to God had half-a-dozen or so Blue Birds flying around my tree within an hour of this nontypical walking by my stand. We don't see the blue birds too often. I tried to capture some video but my footage was poor. Anyway, I had seen this buck a couple of times and even captured a photo with my Cabela's D50 trail camera. I had captured 2 trail camera photos of this buck with my Cabela's D50 and Stealth I590. Just yesterday I had made the decision to add him to my hit list. It was brutally cold this morning and I almost said "Enough" at 10 a.m. but decided to stick it out. At 11:15 he came into view from the northwest and worked his way in my direction. A soft grunt encouraged him to maintain his path. All of my practice-drawing the last few days from the treestand worked well as I drew early, let him step into my very small shooting hole at 20 yards, I gave him a "MAAA! ", he stopped, I settled my top pin at center mass behind the shoulder and squeezed the trigger of my Tru-Fire release. The Easton 400 Full Metal Jacket arrow caught both lungs. He fell over about 80 yards down the hill. I love the Hoyt Katera XL (purchased from Scheels). The arrow was there in a flash and my 58 lbs sent the arrow right through the vitals of the deer. The arrow laid on the ground at the shot. The deer had broken 3 points since I had seen him on Tuesday. He lays claim to being the first buck harvested with my Katera XL. It was a glorious day to be in the deer woods. Not too many like it. 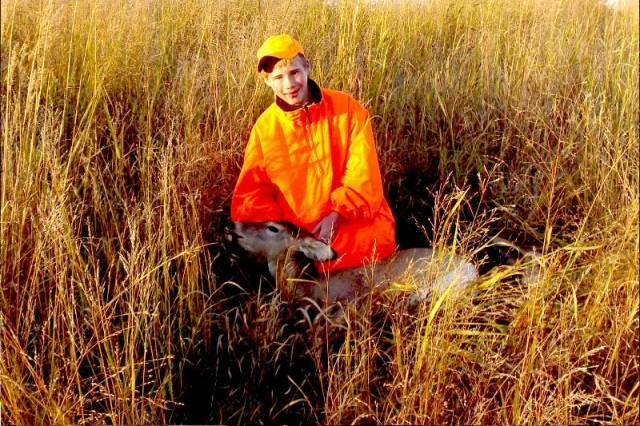 I predict a lot of deer were killed today 'Somewhere in Iowa'. 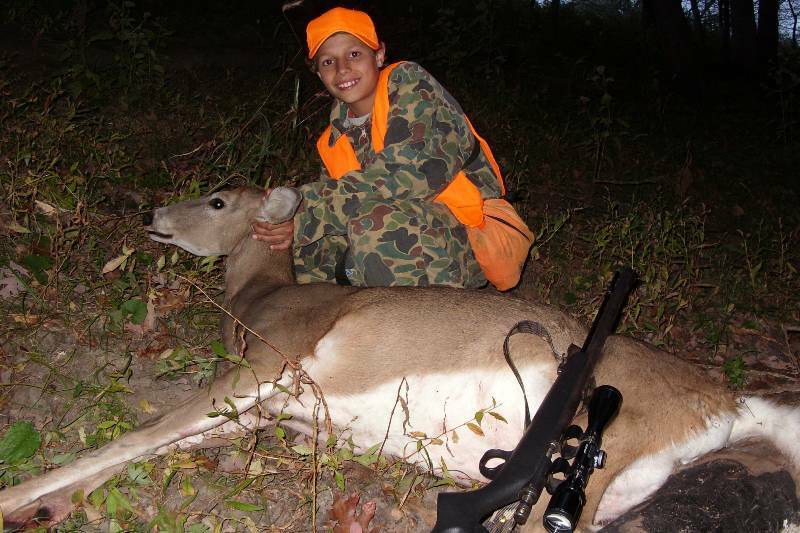 Attached is a picture of Jay’s first deer ever. 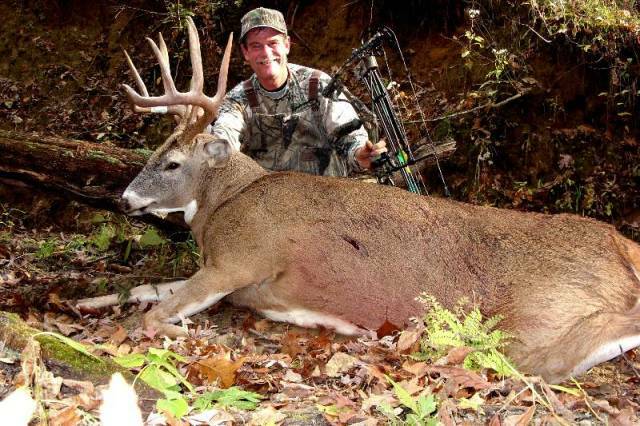 He elected to introduce himself to the sport of deer hunting with archery tackle, and Sunday morning was his first morning in the stand. After sitting until 8:30 or so with virtually zero deer movement, in an otherwise extremely productive area, we decided to get down and warm up. Not satisfied with Jay’s first deer hunting experience, I decided that we would get aggressive and try to make something happen before he drove all the way back to DM empty handed. As a result, I guided him to a known bedding area with eyeball high switch grass and told him we would try some very aggressive rattling and calling to try and coax a buck out of the rack. Well, the first setup did not yield any activity, so we moved 100 yards or so closer to the bedding area at a fence crossing between two thickets. At this point I vigorously worked the rattle bag, throwing in some deep grunts and buck growls, along with some tending grunts. Painfully I slowly turned to look at Jay who had reached full draw on his seat and one knee, partially concealed by the tall grasses. All at once he loosed the arrow and instantly I heard the arrow strike the buck with a solid “thump”! Next, I heard the deer running and crashing through the switch grass and I quickly grabbed my binoculars to get a fix on his position. At 80 yards the buck stopped, and I could just make out the massive rack above the grass. Out of earshot, Jay and I absolutely fell apart, adrenaline overwhelming our senses, unable to process what had just happened. After several high-fives and a hug or two, we calmed down enough to begin analyzing the situation. We both felt like it was a good hit based on the solid thump we heard. In addition, the deer was quartering away from Jay’s position at the shot, and although he didn’t remember “seeing” the arrow hit, he was confident in the placement. A lesson I learned early in my archery career goes “when in doubt, walk out”, and even though we quickly recovered the arrow and found good blood, we decided it was best to give the deer some time to expire. After several pictures and much celebration, we got Jay’s first deer loaded in the pickup along with a trove of memories I will never forget. I like to name my bucks. He is called the Barnyard Buck. I got into the stand around 9:00 at 9:30 I took out the rattlin' horns and banged them for no longer than 10 to 15 sec. When this guy walks around this abandoned barn (hence his name). He was startled at first then calmed down and proceeded to walk down the fence line. I stopped him in my shooting window and made an 18 yd shot. I gave him 3 hours, he went 80 yards or so into the deepest ravine he could find. I contacted a couple of friends to help with the drag, Thanks Jeremy, and Tom. 7:38 a.m., 16 degrees, calm wind. It was a perfect morning to be in the Iowa deer woods. A big thanks to Mike and a small thanks to Dan to help recover the deer. December 22nd opening day of Late Season Muzzeloader I was off to the field and sitting before sunrise. My hunting buddy and I have been watching this particular buck since September and have a few trail camera pictures of him. I chose to sit behind an evergreen tree that overlooked most of the farm. At 8 am sharp this buck came out into the open along with a herd of deer. With the big boy standing about 270 yards, I chose to back out and not risk the shot or a stalk. I went back that evening to try to intercept him coming back out to the food plot, but did not see him. That next morning, Dec. 23rd I decided to get out again early and sit close to where I had seen him the morning before. The wind was perfect and I knew that the herd of deer should be coming soon. Like clockwork, 8 am, the herd came walking through, all within 100 yards of where I was set up. I looked behind all the distractions and could see his rack walking close to me. I waited until he got in the open and squeezed the trigger on the TC Omega and sunk a Shock Wave right behind his shoulder. It just goes to show you that all the hard work and dedication does pay off. My wife is happy that the long deer season is now over, but little does she know there are still many does that need to be managed before Jan 10th. Well what a Christmas day. I had opportunity to slip out Christmas afternoon since some of our family Christmas time would take place Friday and Saturday. With the strong SE wind I found a 6' diameter maple tree to hide my XXL body. I had plenty of does and a big framed 4x4 west of me heading for the corn. I needed a shooter buck east of me to offer me a shot. Shortly before 5 p.m. I watched as one doe perked her ears up and looked behind me. I peeked around my big old maple tree and there came the 5x4 I was looking for at about 30 yards. You need to understand that peeking around this maple tree was like peeking around the corner of a house. Well, now my maneuver, I needed to grab my bow, turn 180 degrees and wait for the deer to continue north for a 30 yard quartering away shot and to clear my huge maple tree. I looked from behind my tree and could see his head 20 yards straight east of me. Three peeks later and he is still standing there. On my fourth peek he is gone. I turn another 180 degrees assuming he's headed back south. I don't see him. Holy crap! There's his eyeball 1 yard from me coming around my tree. Yes, 1 yard and remember I'm on the ground! He had followed my tracks over to my 6 foot diameter maple tree. As I begin my draw at 1 yard. He explodes onto the frozen creek and bounds straight south of me. I give him a MAAA! MAAA! MAAA!. He stops at 20 yards, I settle in and send the Easton 400 FMJ through both lungs. He runs up the hill, stops, falls over, and then tumbles back down. I get over to the buck, turn him over as he is laying on his antlers in a twisted heap from his 15 foot vertical fall and crap, he busted an antler. I walked up the hill and found the antler stuck to a cedar stump. Just my luck. To top it off, he has a belly scar from my 'whiff' in early November. My spouse and I had a heck of time trying to take pictures with one broken antler. The dark didn't help matters either. I will never forget that eyeball clearing my huge old maple tree at 1 yard and the total chaos that ensued. Talk about a rush! It was a night every hunter dreams of, I was sitting on the back side of a terrace watching about 20 deer in a bean field. When all of a sudden, about 4:30 PM, this big guy steps out of the timber with 2 does. He was about 300 yards away when he stepped out into the bean field and the way he was headed I knew I had to get closer. The terrace I was sitting on wrapped around to my left and that was the direction he was headed. With a 15 mph wind into my face, I knew that I had a chance to crawl my way around the back side of the terrace to get closer to him. I crawled about 100 yards and then peaked up over the terrace and there he stood, I ranged him at 156 yards and 2 days before that I sighted my gun in dead on at 150 yards so I knew that he was in range for me to take the shot. He was quartering to me when I shot and I hit him a little far back, when the smoke finally cleared he was standing in the same spot with his back arched up. 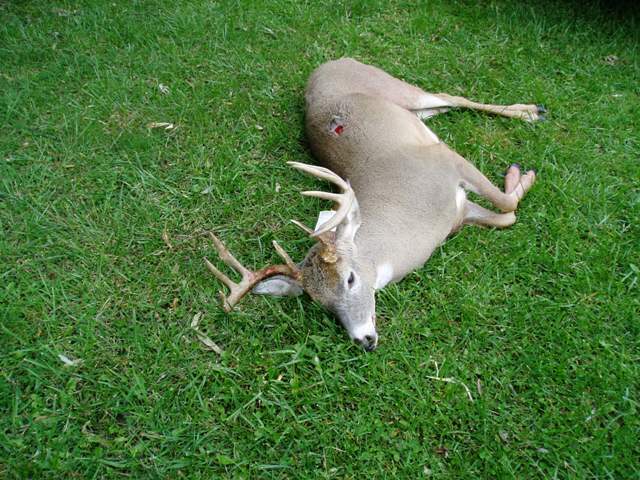 I then reloaded my muzzleloader and shot him again and that time I hit him in the vitals, he fell right in his place. It was the most excitement I have ever experienced, I went from being really cold from facing the wind for 2 hours to being very hot. The walk out to see him was nerve wrecking, I knew he was big but I did'nt know how many points he had or if he was broken off at all. He was just like I had hoped, he has 10 points with a 23 3/4" spread and has 6" bases. 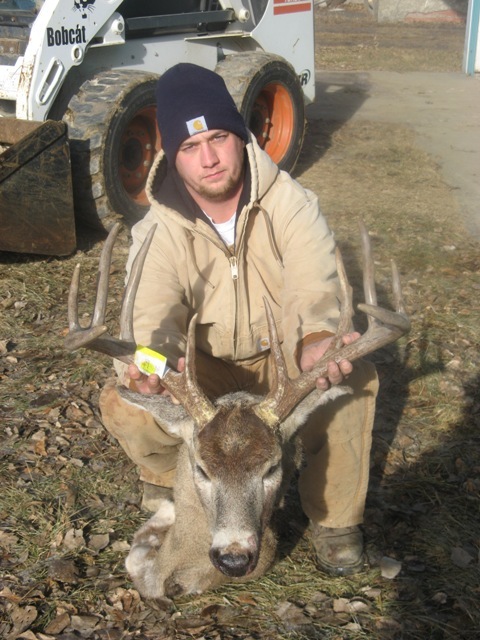 He will score somewhere in the 170's and by far my biggest buck ever. When I got home I found out that I had his sheds from 2 years ago and that made the hunt even better! A friend and I were out Friday evening doing some pushing. A 130 class buck came up and I was going to put him down, but the great friend he is he convinced me not to. A little later two more bucks got up and they were much bigger. They were not in much of a hurry at all. As the second two bucks stood broadside I was going to shoot the front one, but my buddy said the back one over and over again. After the smoke cleared we had him down. 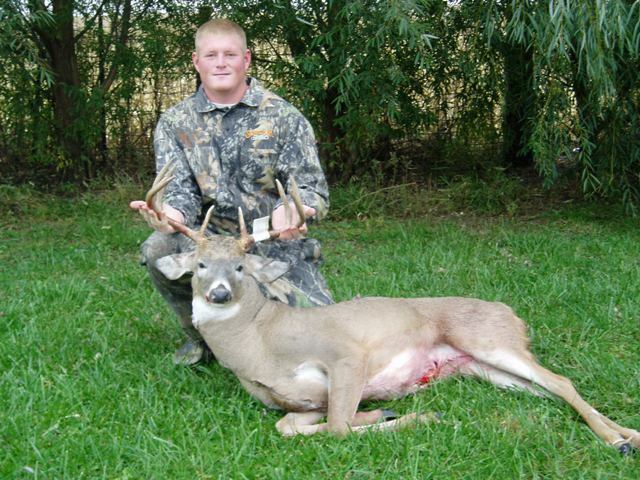 I am glad he coached me through it, this buck got bigger when we got up to him. Pictures don't do much justice. He is everything I hoped for. T/C Omega, 200 grains shockwave, 100 grains of Triple Seven, Leupold Rifleman Scope. Did some pushing on Friday with a couple of buddies and got lucky enough to get a shot at this buck. I measured him at 140 even. 25 inch beams and 19 inches inside spread. A nice buck for the 9th of January. Thanks to my friends for helping do some pushes and getting my first muzzle loader buck. 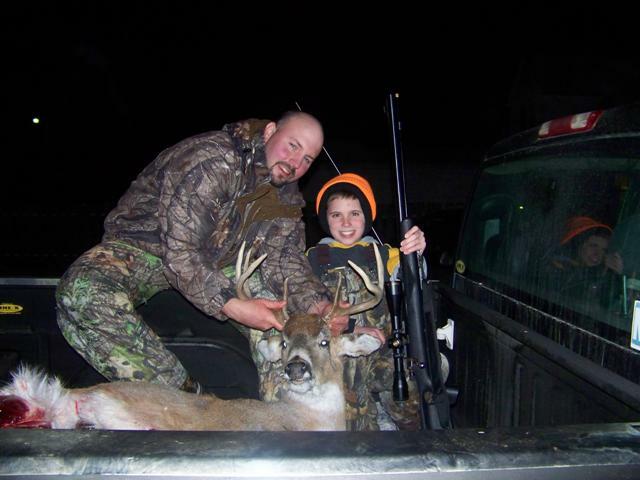 Owen shot his first deer the last day of the season.